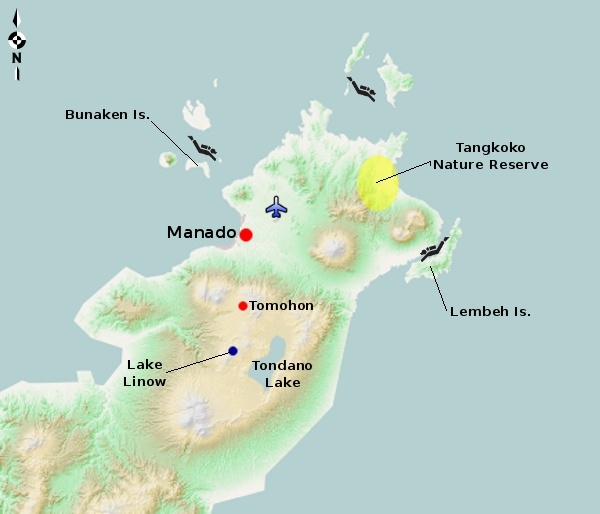 Manado was established by the Dutch in the 17th century, and was once praised for its beauty. Unfortunately, the city was heavily bombed during World War II, and again during the Indonesia battle for independence, and the modern reconstruction has left the city less than picturesque. While there are monuments to the heroes of the struggle for independence all around town, there is little to see in Manado itself. Most international visitors come to explore the jungles and volcanoes around the city, or dive the waters of the offshore islands. The sights around Manado. Click on any of the icons for more details. The diving around North Sulawesi is widely considered to among the world's best. Part of the attraction is wide range of dive sites available in relatively close proximity, from the fantastic walls of the Bunaken National marine Park, to the critter-filled sandy bottom of the Lembeh Strait or the soft corals of Gangga Island. For more information on diving around Manado, see the SEA Undersea guide to North Sulawesi dive sites.